Democrat Stacey Abrams was poised to become America’s first black female governor in Georgia during the 2018 midterms. She lost by only 1.5 percentage points. Because of allegations of voter suppression, Abrams felt duty-bound to legally challenge potential voting irregularities before offering any type of concession. By the time she exhausted those legal options, she still had fewer votes than Republican Brian Kemp. Even though she lost, I still think she – and future black candidates in the Deep South – won. Abrams’ candidacy – along with the breakthrough candidacy of Florida’s Andrew Gillum – help to dismantle the implied fear of many Democratic observers that black candidates cannot be viable statewide candidates, especially in the Deep South. In general, despite the election of Barack Obama and the near proportional representation of blacks in the U.S. House of Representatives, blacks are underrepresented in statewide offices like governor, U.S. senator and state attorney general. In the more than 150 years since Reconstruction, there have been only two elected black governors, 14 lieutenant governors, five elected U.S. senators and, until Election Day, four state attorneys general. On election night, four African-Americans won races to serve their states as attorney general and one African-American won a lieutenant governor’s seat. Scholars attribute part of the current disparity to demographics. While there are congressional districts with large minority populations that have a history of electing black representatives, no state has a majority black population that would likely do the same. Because no state has a majority African-American population, scholars and political analysts have opined about the likelihood that non-black voters would be willing to vote for black candidates statewide. States like Massachusetts and Virginia, which have larger white Democratic populations, have elected African-American governors. However, this has been less likely to happen in the Deep South, where racially polarized voting is more stark and gives the advantage to Republican, typically white, candidates. For these reasons, African-American Democratic candidates for statewide office in Georgia, as in other parts of the Deep South, have often faced skepticism. Sometimes, they have run as the sacrificial lamb candidate – the one who has no chance of winning, but runs anyway to ensure Democratic representation on the ballot. Other times, seasoned black candidates, such as former Atlanta Mayor Shirley Franklin, have chosen not to run for statewide office. They decided not to waste political capital on a race that would be hard for any Democrat to win. In lieu of willing black candidates, Georgia Democrats have often nominated centrist white candidates such as Roy Barnes or Jason Carter. They hope such candidates will win back working class or suburban white voters who started leaving the party after the civil rights movement and first helped to deliver the governor’s mansion to the Republicans in 2002. Usually, regardless of their race, both the white and black Democratic candidates ended up losing. In this context, Abrams offered a new path – one that did not pay off in this election, but will likely reap dividends in the long run. Abrams proposed expanding the Democratic Party base in Georgia through voter registration and intensive voter mobilization designed to drive up turnout. Her campaign invested in canvassing and phone banking operations, taking to heart the lessons imparted by scholars like Don Green and Alan Gerber, who demonstrated how canvassing and live phone banking increases voter turnout. Abrams radically asserted a strategy premised not on trying to woo back whites who had left the Democratic Party long ago, but focused on building a new base of voters of color, whose population in Georgia is growing. Abrams was challenging the practice that political scientist Paul Frymer referred to as Democratic “electoral capture.” Frymer argues that Democrats assume that they do not need to target campaign messages to black voters because data show roughly 90 percent of them vote Democratic. Instead, Abrams looked at the diversity of the Democratic base in Georgia and argued that because of their strong Democratic voting behavior, blacks deserved additional campaign attention. By focusing on minority outreach, Abrams turned the notion of electoral capture on its head, arguing that Democrats could yield more black votes if they campaigned in black communities. Moreover, as a serious candidate of color, Abrams also challenged the idea that only centrist white candidates could put together a formidable campaign coalition in Georgia. 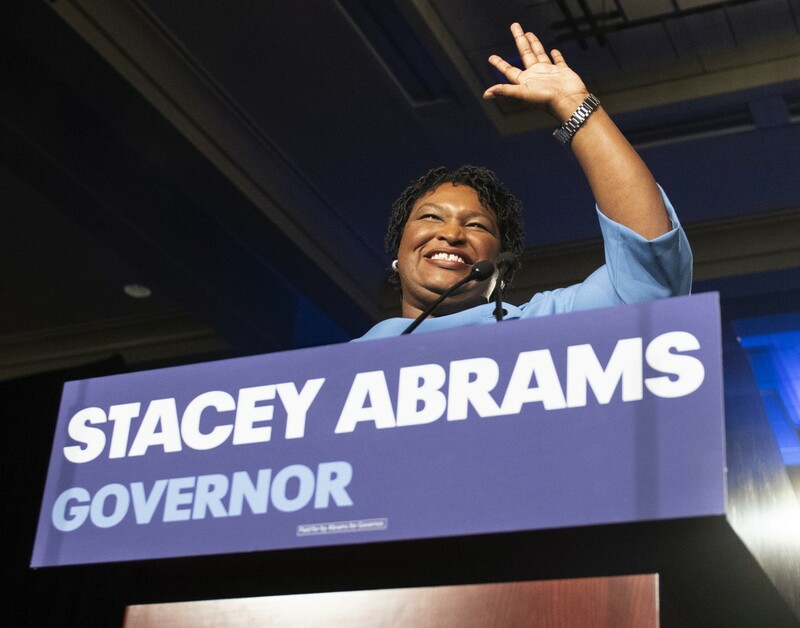 By expanding the electorate through voter registration and taking painstaking care to remind new and longstanding voters to turn out to vote, Abrams earned more votes than previous Democratic gubernatorial candidates. Proportionally, Abrams earned slightly more support among white voters than Jason Carter, the last Democratic gubernatorial nominee. Thus, she outperformed her white Democratic predecessors using a wide-ranging and inclusive strategy. So, even though Abrams lost this election battle, she still won in many important ways. To be sure, Abrams’ race and gender subjected her to particularly bigoted attacks. And when I say that she still won, I am not ignoring the ways that voter suppression may have dampened her support. However, Abrams’ performance shows that black candidates in the Deep South can run effective, highly competitive campaigns. Democratic candidates still face challenges running in solidly Republican states, but Abrams has provided a template for showing how black Democrats can be competitive, even in parts of the Deep South. As such, the results of the 2018 election demonstrate that the implied fears about nominating serious black candidates for statewide office in the Deep South are misplaced. While party is still a disadvantage for any Democratic candidate in Republican-leaning states, black candidates like Stacey Abrams and Andrew Gillum have shown how they can navigate racial landmines and partisan disadvantages to run competitive races. Instead of assuming that black candidates will underperform their white counterparts running for statewide office, perhaps we should focus our attention on rooting out institutional burdens that may make equal access to the ballot more difficult. Andra Gillespie is an associate professor of political science at Emory University.